CRIME, GUNS, AND VIDEOTAPE: Compromise Gun Rights to Accommodate The Dangerously Mentally Ill? 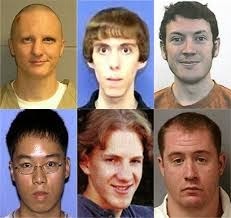 Compromise Gun Rights to Accommodate The Dangerously Mentally Ill? Los Angeles, CA—There is little doubt that every mass shooter in the USA suffered from severe mental illness, usually schizophrenia. Most or all have rejected taking anti-psychotic medication and accordingly they went on deadly rampages. We used to put these people in mental hospitals that were more tolerable and comfortable than our jails. After our medical community determined that wonder drugs were more humane that hospitalization they convinced government officials to close the asylums. Now the same people are simply sitting in jails and prisons without treatment. The effort to be more humane has backfired. The solution offered against violence by the insane is to eliminate gun rights for the sane and law-abiding. They seem to forget that the insane use knives, clubs or brute force to murder. They can’t seem to understand that before the Oklahoma Bombing and 9/11 attack on America that the most significant mass murder was committed with a single gallon of gasoline at the Happyland Social Club taking nearly 100 lives. It’s impossible to keep deadly weapons out of the hands of the insane that are driven or determined to kill. We must face that fact and deal with it. I don’t have the answers to or mental health problems of America anymore than I have for the millions of Americans using street drugs and alcohol. However taking the rights of the sane, sober and law-abiding is no answer. If we really care about the mass killings we have to address and revisit the real issue behind these massive catastrophes. If we refuse to consider reopening the mental hospitals we must accept that we will continue to have these unthinkable tragedies. The horrible massive shootings were unheard of in America until we ended hospitalization of the mentally ill.
Is it fair to allow the dangerously mentally to roam free and force the law-abiding to surrender their right to keep and bear arms? Disarming people does not make them safe. Not only is it unfair it’s absolutely unconstitutional. I think that these meds actually contribute to this behavior.